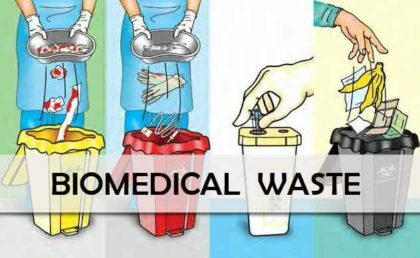 Hospitals/Healthcare centres in the country will be required to treat their waste more seriously, as the New Bio-Medical Waste Rules 2016 are calling for major changes and stricter requirements both on the part of the hospitals/healthcare centres (occupier) as well as the operators. The guidelines, which were released two months back, contain a number of changes and additional requirements that are supposed to be followed by the hospitals, nursing homes, clinic, dispensaries, veterinary institution, animal house, pathological laboratory, blood bank etc. These range to various norms relating to treatment of wastes, registrations process, record keeping by organisations, duties of operators as well as monitoring and implementation by relevant authorities of compliance under the law. No More Plastic– Rules specify that occupiers will have to phase out use of chlorinated plastic bags, gloves and blood bags within two years from the date of notification of these rules. Bar Coding– Occupiers will have to establish a Bar- Code System for bags or containers containing bio-medical waste to be sent out of the premises or place for any purpose within one year from the date of the notification of these rules. Display Monthly records on Website– Occupiers will have to maintain and update on day to day basis the bio-medical waste management register and display the monthly record on its website according to the bio-medical waste generated in terms ofcategory and colour coding as specified in Schedule I. Reporting of Incidents – report major accidents including accidents caused by fire hazards, blasts during handling of biomedical waste and the remedial action taken and the records relevant thereto, (including nil report) in Form I to the prescribed authority and also along with the annual report. Hold Records for 5 years– Every authorized person shall maintain records related to the generation, collection, reception, storage, transportation, treatment, disposal or any other form of handling of bio-medical waste, for a period of five years, in accordance with these rules and guidelines issued by the Central Government or the Central Pollution Control Board or the prescribed authority as the case may be. Every State Government or Union territory Administration shall constitute District Level Monitoring Committee in the districts under the chairmanship of District Collector or District Magistrate or Deputy Commissioner or Additional District Magistrate to monitor the compliance of the provisions of these rules in the health care facilities generating bio-medical waste and in the common bio-medical waste treatment and disposal facilities, where the bio-medical waste is treated and disposed of. The District Level Monitoring Committee constituted under sub-rule (4) shall submit its report once in six months to the State Advisory Committee and a copy thereof shall also be forwarded to State Pollution Control Board or Pollution Control Committee concerned for taking further necessary action. The District Level Monitoring Committee shall comprise of District Medical Officer or District Health Officer, representatives from State Pollution Control Board or Pollution Control Committee, Public Health Engineering Department, local bodies or municipal corporation, Indian Medical Association, common bio-medical waste treatment facility and registered nongovernmental organisations working in the field of bio-medical waste management and the Committee may co-opt other members and experts, if necessary and the District Medical Officer shall be the Member Secretary of this Committee.